"GM for A Minute" was a working title of Buddy Nix's much-awaited autobiography, along with "Adventures in Narcolepsy" and "That Dog Won't Hunt!" Morse is only 26,I thought he was over 30. Agree. Spend $$ on OL. OL stirs the drink in the NFL. No OL, no winning. I'd bring back the 3.8 liter V6. One of the greatest engines of all time. I still don't know why they are killing off the Volt. This is a slam dunk. Completely overhaul the OL with quality vets, get Josh Allen his version of Kupp or Edelman in Humphries, and keep Jordan to shore up depth on the DL. #15 - T.J. Hockenson, TE. #125 - BPA rest of draft. BOOM! 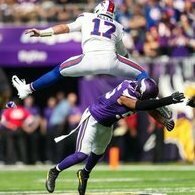 Bills make deep playoff push in 2019. No tight end. Took a starting right tackle, starting right guard, starting center!! Also got mo Wilkerson, and an underrated Adam Humphries. I'd love this!! Honestly, the chart is very skewed and worthless. Humphries isn’t going to be as cheap as this chart suggests for example where it has him in the cheapest category. He should have been in the $3 category at least. If I was a FA and saw a situation like Peterman/ McCarron I'd probably sign elsewhere also. Now that I've had a chance to see the cannon on Josh Allen I may reconsider. Give me the 5 $3 guys. This post makes me realize just how little i watched this year- Harris would have been my lowest TE and Suh would habe been my highest DL. My picks though would be saffold , WR williams, TE cooks, jordan phillips- who i think is good rotation guy and Juwan James . Line and Lbs are set for years. Same for Jesse James, Mitch Morse. Draft TJ Hockenson and Greedy, David Sills V, Hunter Renfrow, & Isabella if you can by trading down. Suprisingly, there are only 3. That said....is your name Dougie? Agreed, and I don't believe McDermott & Beane would hold a grudge over that.